If you are being investigated by the police or any other investigative body then it is likely that you need to obtain legal advice in order to know your rights and obligations in the situation and those that the investigators are required to give you. There are many different criminal charges that the police and other agencies can charge a person with. These may include, but are not limited to: assaults, sexual offences, drug offences, domestic violence breaches, and fraud. Ferrall & Co. Lawyers are able to assist you in all areas of criminal defence. We are able to represent you in relation to any criminal charge you have been accused of, whether it is a summary offence or something of a more serious nature. While we are based on the Sunshine Coast, however we service all Courts in South-East Queensland, meaning we are able to appear in any Court at any location. It is very important for you to be aware that you are not required to give the police a statement at any time; this is your right to silence and it is very important to your defence. Prior to speaking to the police or any other investigator we would recommend for you to contact our office. Ferrall & Co. Lawyers will provide you with confidential impartial legal advice in a timely manner so that you are aware of your position and are able to make informed decisions on how you wish to proceed with your matter. There are numerous stages that a criminal defendant may ultimately go through and Ferrall & Co. will be there with you through each of them. If you are charged with a crime and are required to appear in Court, we are able to act for you and go through the process with you. We will work with you to obtain the best possible outcome for you, whether that is to progress your matter through a trial or enter a plea of guilty to the charges. Traffic offences can have a detrimental effect on people’s lives. Most people require their driver’s licence in order to get to and from their place of employment and without it they can experience significant personal and financial hardship. 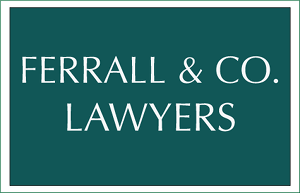 Ferrall & Co. Lawyers act in all traffic related matters, from drink driving charges to applications for special hardship licences, as well as more serious criminal charges associated with the use of motor vehicles. The seriousness of the traffic offence will often determine the severity of the penalty imposed. While many people are let off with a fine, others will be disqualified from holding or obtaining a driver’s licence for a period of time, with disqualification periods lasting from months to years, and others may be sentenced to a period of imprisonment. Traffic offences and the penalties that can be imposed for them can have significant ramifications on people’s lives. Ferrall & Co. Lawyers are experienced in traffic matters and will be able to guide you through the legal process in order to obtain the best outcome for your matter. It is of the utmost importance for you to obtain independent legal advice as soon as you possibly can in relation to any traffic offences. Ferrall & Co. Lawyers are experienced in both lodging and defending domestic violence applications. There is a common misconception that domestic violence is only physical in nature. The legislation providing a definition of domestic violence outlines a multitude of behaviours from one family member to the other. The definition includes behaviours such as emotional and psychological abuse, threatening and coercive behaviour, economic abuse and damaging a person’s property. There is also a misconception that domestic violence applications can only be made by spouses or romantic partners. This is not the case. Anyone who is in a relationship, whether that is a partner, sibling, or parent, is able to utilise the domestic violence legislation to stop a family member or partner from abusing them. If you are in a domestically violent relationship, Ferrall & Co. Lawyers are able to assist you with the process of bringing an application for a Domestic Violence Protection Order. We are also able to assist you if you have been served with an application that is applying for an order to be made against you. If you are currently living in a situation where you feel a protection order is necessary then we are able to assist you in bringing an application for a protection order. Ferrall & Co. Lawyers offer fixed fee arrangements, which include drafting the application for a protection order and attending the first Court mention of the application. Please call us to discuss our fee arrangements and your particular matter. If you have been served with an application for a domestic violence protection order we are able to assist you if you wish to contest it. Ferrall & Co. Lawyers offer fixed fee arrangements which includes drafting a response to the application for a protection order and attending the first Court mention of the application. Please call us to discuss our fee arrangements and your particular matter. If you have a Domestic Violence Order against you and breach it, you are likely to be charged with a criminal offence. The maximum sentence for breaching a Domestic Violence Order for the first time is 3 years imprisonment, and up to 5 years imprisonment for breaching it a second time. In certain circumstances people may also be charged with a domestic violence offence. If this happens to you then you may not be entitled to bail unless you show cause as to why you should be released. It is therefore very important for you to seek independent legal advice if you are accused of, or charged with, breaching a Domestic Violence Order or a relevant domestic violence offence.